Editor’s Note: WSKG has asked faculty and graduate students in the History Department at Binghamton University to explore the history behind PBS’s new drama Mercy Street. 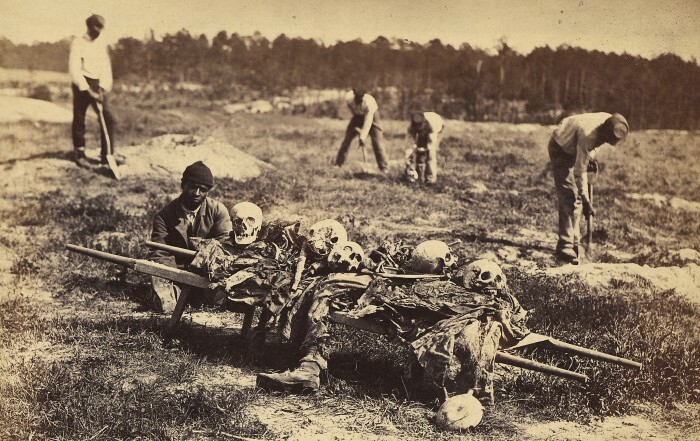 In today’s blog post, graduate student Melissa Franson discusses the 19th century concept of a “good death” and how the Civil War challenged that notion. In the first episode of Mercy Street, we are confronted with the gruesome injuries and carnage that men inflicted upon one another during the Civil War. One of the most poignant moments in the series comes when a young soldier is brought into the hospital literally attached to the Union flag. Nurse Mary Phinney (Mary Elizabeth Winstead) and Jedediah Foster (Josh Radnor). Blood from the young soldier’s wounds has glued his hands to the flag. Having already lost his father in the war, the un-named soldier was unwilling and unable to relinquish his sole responsibility – making sure the flag did not fall. The young, scared soldier desperately tries to assert his masculinity while being comforted by the Army Chaplain, Harry Hopkins. To distract the young soldier from his injuries, Hopkins suggests that nurse Mary Phinney compose a letter for the young soldier. 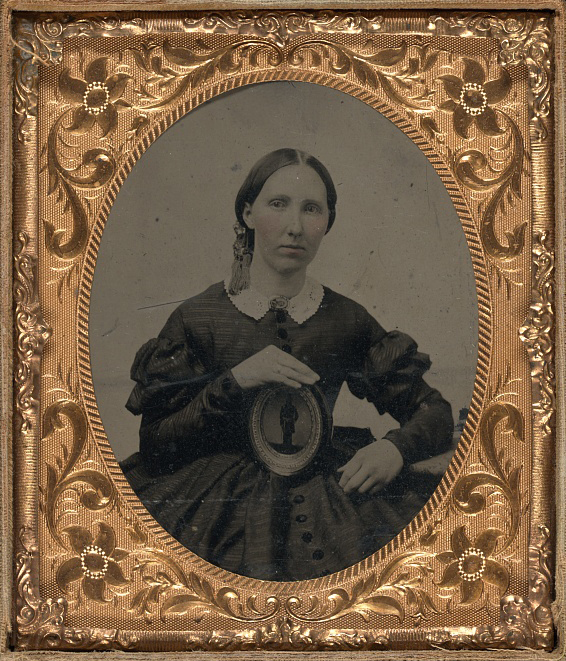 An unidentified woman in mourning displays a framed image of a solider. Library of Congress. The scenes with the young soldier are heartbreaking, depicting the horrific and human costs of war. They also reveal how the Civil War challenged traditional nineteenth-century cultural norms regarding death and mourning. 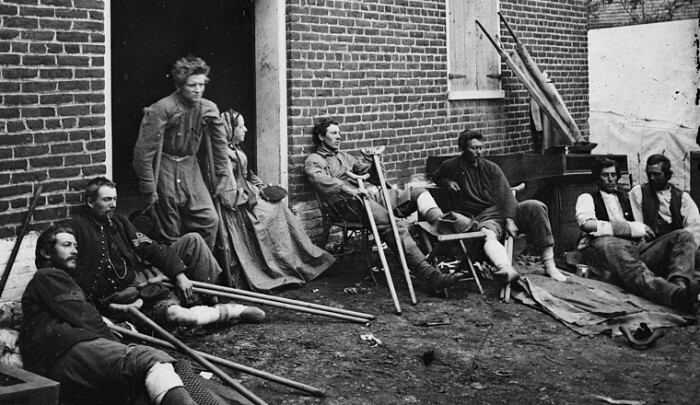 How Americans dealt with such challenges is the subject of historian Drew Gilpin Faust’s award-winning book This Republic of Suffering: Death and the American Civil War. In her book, Faust demonstrates how the Civil War forced Americans to reconsider what it meant to die a “Good Death” and thus altered many rituals and conventions associated with death. Prior to the Civil War, dying a “Good Death” fell within the domestic realm, where women were the primary caregivers for the sick and ailing. Family members gathered at the home, assembling around the deathbed to witness the dying person’s final moments, listening to his final words, and attesting to the condition of his soul at the exact moment he passed. The family provided comfort for the dying, ensured a burial in the family plot and grieved the dead through the appropriate stages of mourning. The American Civil War remains America’s most deadly war. In an article entitled, “A Census-Based Count of the Civil War Dead,” former Binghamton University historian and demographer David Hacker revised the oft-quoted number of 620,000 Civil War dead to upwards of 752,000. Such numbers reveal the dramatic scope of the death and suffering caused by the Civil War. 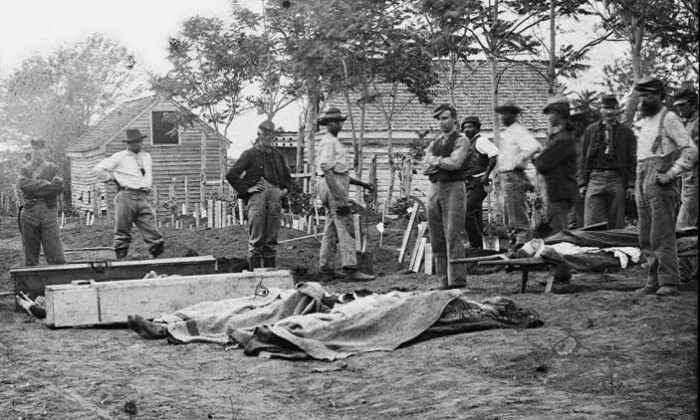 A burial party on the Battlefield of Cold Harbor, Virginia. Library of Congress. The deaths of hundreds of thousands of soldiers had innumerable consequences for nineteenth-century American society. Soldiers who died suddenly during battle often had no witnesses to attest to the moment of death, nor was there any time for the fallen soldier to atone for his sins in his last moments; however, such practices were considered integral to dying a “Good Death.” At times, fellow soldiers or nurses composed letters to family members in order to attest to the soldier’s “Good Death”, his bravery and an acceptance of God’s salvation in his final moments. Nurse Mary’s decision to close the soldier’s letter with his acknowledgment and acceptance of impending death indicates to his family that he died a Good Death. By dying at a hospital, the young soldier also improved the chances that his family could come collect his body. Dying on the battlefield often meant dying amongst strangers hundreds of miles from a soldier’s home and family. After a particularly violent battle, the sheer numbers of dead required burial in mass graves. The traditional mores of treating dead bodies with respect and dignity were overwhelmed by the need to remove corpses as quickly as possible before they began to decompose. Bodies already stiff with rigor mortis were also difficult to maneuver into graves. Soldiers tasked with the gruesome burden of burying fallen fellows and foes were directly confronted with the human cost of war. In addition, inefficient record-keeping by overburdened army and medical staff meant family members who traveled to collect their loved one’s remains were often stymied by the inability to locate their dead. Many times families returned home empty-handed. 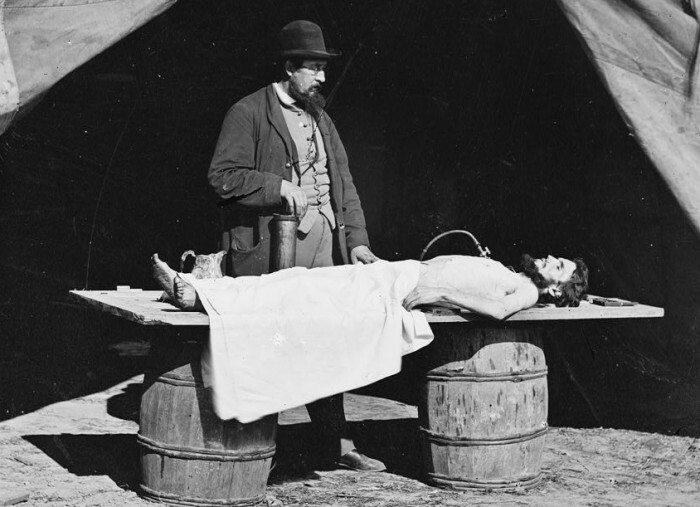 The Civil War forced Americans to reconsider death in many ways. On a practical level, embalming bodies became more popular, allowing family members to transport soldiers home to their final resting place. As the numbers of dead Civil War soldiers increased, new methods to account for the dead emerged. For the Union, record-keeping efforts of the Christian Commission and the Sanitary Commission improved, while the Confederates had regional agencies such as the Louisiana Soldiers’ Relief Association and the South Carolina Relief Depot. However, the dissemination of print and popular culture, celebrating a soldier’s “Good Death,” most clearly demonstrate the dramatic changes the Civil War brought to bear in nineteenth-century conceptions of death. Magazines, newspapers, photography exhibits, poems, songs, plays, and books immortalized dead Union and Confederate soldiers and pronounced their deaths “good”. Although a fictional portrayal, the dramatic events that unfold on Mercy Street illustrate the myriad ways that the Civil War affected American society. The nurses, doctors, volunteers and other important characters of the show provide the bulk of the drama for the show, yet it is the many nameless soldiers who populate the Mansion Hotel Union Hospital and epitomize the human cost of war. While many of these soldiers remain silently suffering in the background, they are a reminder that hundreds of thousands of soldiers also lived and returned home changed men, forever and irrevocably altered by their experiences during the war. Drew Gilpin Faust, This Republic of Suffering: Death and the American Civil War (New York:Alfred A. Knopf, 2008). David J. Hacker, “A Census-Based Count of the Civil War Dead,” Civil War History 57:4(2011): 306-347. Melissa Franson is a second year graduate student in the History Department at Binghamton University. She studies nineteenth-century United States history, with a focus on the Civil War. Her current project looks at the various ways that the rural northern home front of New York State was affected by the Civil War.